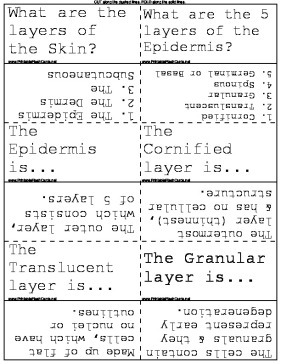 Medical doctors and biology students can learn about the structure of the epidermis with these skin flash cards. The Epidermis is... The outer layer, which consists of 5 layers. The Cornified layer is... The outermost layer (thinnest), & has no cellular structure. The Translucent layer is... Made up of flat cells, which have no nuclei or outlines. The Granular layer is... The cells contain granuals & they represent early degeneration. The Spinous layer have... Cells w/many sides & they represent early degeneration. The Germinal or Basal layer is... The deepest of the Epidermis & the cells continue to divide. They contain Keratin & Melonin. The Dermis/Corium or True Skin have 2 receptors... 1. Pacinian Corpuscle - Deep pressure. 2. Meissner's Corpuscle - Light Touch. What is Reticular? Is beneath the Papulla & is the layer w/the blood vessels.